About a few months ago, I wrote an article about Singapore's Pizza Hut Delivery service and what I ordered. 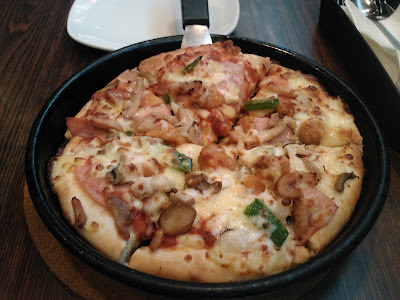 Since Pizza Hut is also popular with its restaurants, in today's article, I am going to do a write-up of my experience at a Pizza Hut restaurant and what I ate at the outlet in Heartland Mall Kovan. Heartland Mall Kovan is a relatively small shopping mall with a lot indie shops. The anchor tenant is Cold Storage Supermarket and has a wide variety of food and beverage outlets like KFC, Yoshinoya, Old Chang Kee, Pizza Hut and more. Heartland Mall Kovan is located in Hougang South also known as Kovan City. It's been a while since I last stepped into a Pizza Hut restaurant. 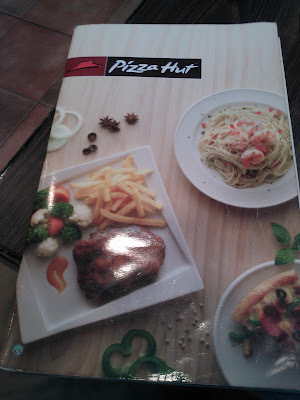 Ever since, many improvements and additions have been made to the Pizza Hut menu. Just about last year or 2 years ago, Pizza Hut launched a new line of main courses ranging from Fish and Chips to Chicken Chop to Bruschetta and so much more. They even had a new range of pastas such as the new Pasta Perfetto series. Unfortunately, I didn't try any of the new additions so I just sticked to the regular items that I always purchase during my past Pizza Hut restaurant visits which you will see when you scroll down further. Let's start with the appetisers first. This appetiser is called the Hut's Platter and consists of several different finger foods with dipping sauce on a bed of mesclun salad. 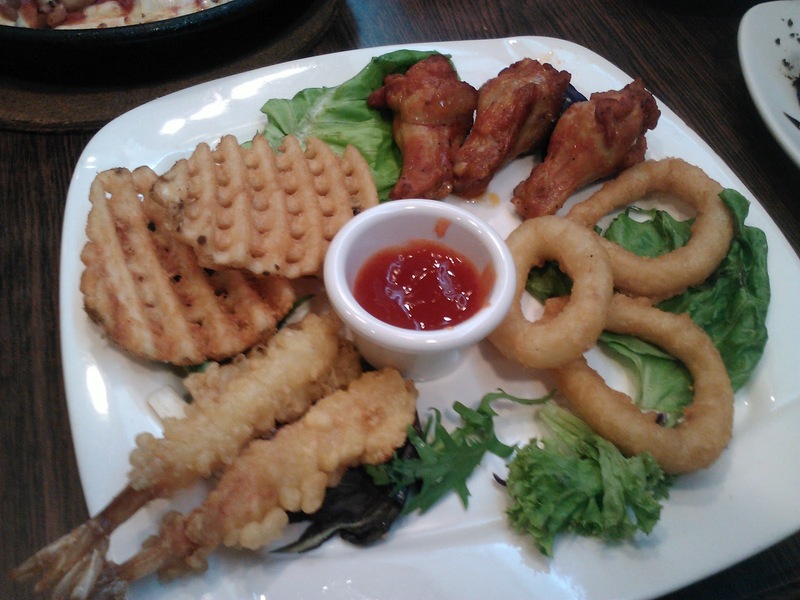 The Hut's Platter has Tempura Prawns, their signature Sweet 'N' Spicy Drumlets, Calamari Rings and my favourite, Criss-Cross Fries. I'm not so sure about you but the picture looks slightly unappetising. Also, they should replace the chili sauce with a wide variety of different dipping sauces. The taste however, is not as unappetising as the picture. I love the Criss-Cross fries, the Calamari Rings aren't that hard to chew, the drumlets were awesome (and spicy) as usual and the prawns were okay. Fans of finger foods and platters should get this as it's a great way to start the meal. 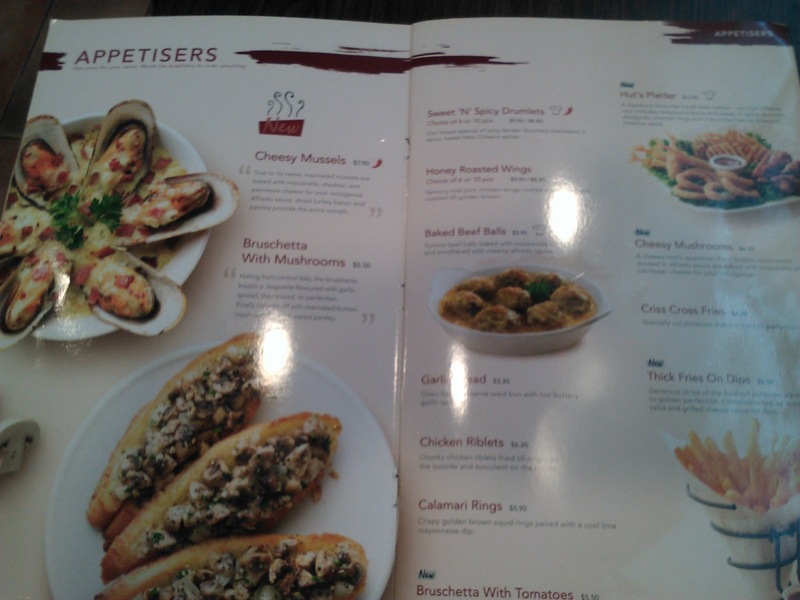 Apart from pizzas, Pizza Hut also sells a wide range of pastas as mentioned above. 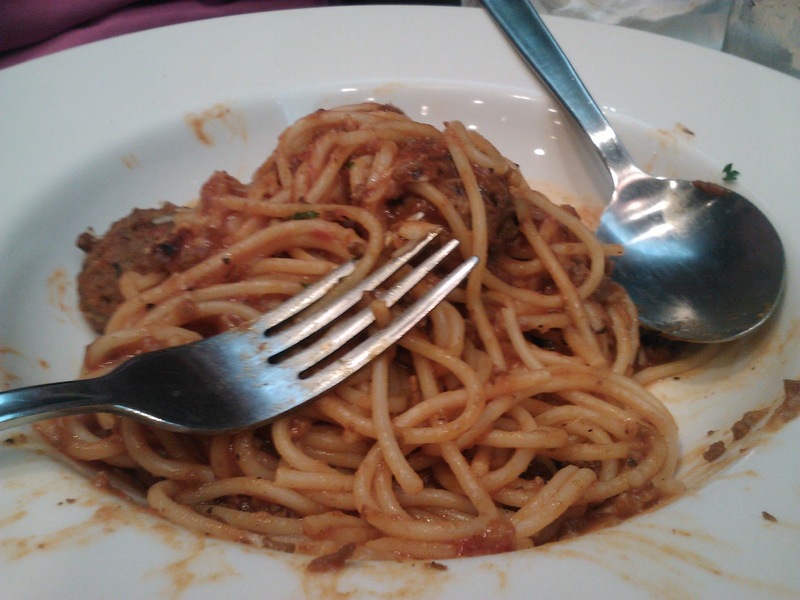 My favourite pasta at Pizza Hut is the Traditional Bolognaise pasta pictured above. I think the picture looks unappetising again. Must be because I took the photo after I finished about half the plate. Anyway, the spaghetti was a little bit on the dry side and that the sauce wasn't as nice and thick as the good old days. The meatball was slightly better as it was big and juicy. The pasta dish was slightly disappointing but I guess maybe it's because my tastebuds have something wrong or that this outlet does not serve pastas which are as nice as other Pizza Hut outlets. Still, if you insist on getting pasta, there are other varieties to choose from. Now it's time for the star of the show (or article). It's the Chicken Supreme Pan Pizza in medium size just like the one in my previous Pizza Hut Delivery article. This pizza has toppings like chicken ham, spicy chicken chunks, roasted chicken, onions, capsicums and mushrooms. The Chicken Supreme Pizza is heaven for chicken lovers like me and you can't go wrong getting this topping. The pizza was served piping hot and it tastes great as usual. Although, I would like to get it with the Stuffed Crust option because I'm kind of sick and tired of the Pan Pizza crust. Pizza Hut also has a new range of desserts. From ice cream to cakes, there are lots of desserts to choose from. The one right above is the Warm Chocolate Cake with Ice Cream. It's basically a simple oddly-shaped chocolate cake with lots of chocolate sauce inside the cake along with ice cream at the side. 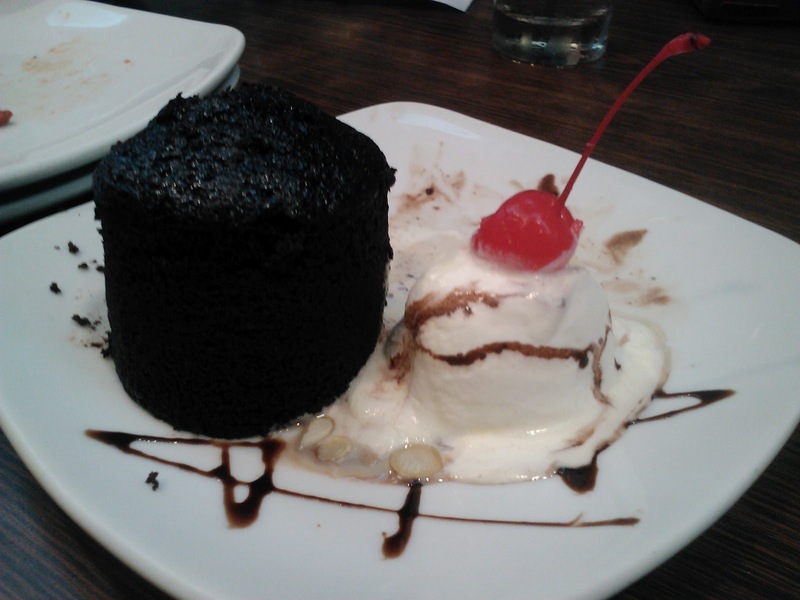 The ice cream is also drizzled with chocolate sauce and there's a piece of cherry on top. What can I say about this cake? Well, I love the cake because of its chocolatey filling and the moistness (is that even a word?). I also love the decorations and the ice cream. There's actually 2 versions of this dessert. One option is the one without the ice cream whereas the one I got is with ice cream which costs an additional few cents. It's a great way to end the meal. The Pizza Hut outlet at Heartland Mall Kovan wasn't crowded even on a Sunday maybe it's because people aren't willing to go out on a Sunday. When it's not crowded, it's great because it's much quieter as you don't have to deal with noisy people, crying babies and so on. What I particularly missed about Pizza Hut's restaurants is the Salad Bar. 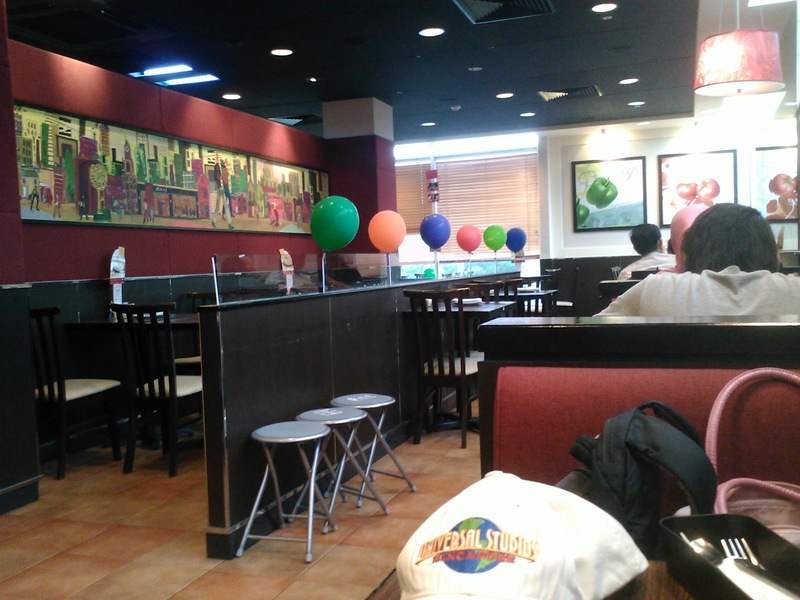 Back then, each and every Pizza Hut outlet with the exception of Takeaway outlets, has a Salad Bar. You pay for a bowl and you get to choose different kinds of toppings for your salad. Also, we could get soups on our own at the Salad Bar too. We just take out empty soup bowls and scoop up the soup and pour it into the bowl. Now, the salads available are prepared in the kitchen by the crew along with the soups. The Salad Bar is definitely something that they should bring back. Overall, my visit to Pizza Hut was fantastic. The restaurant's quiet, the music adds to the calm ambience, the food was hot and freshly prepared and the pizza was tasty as usual. Pizza Hut Heartland Mall Kovan ic definitely the place to bring your family and friends especially when you're celebrating a big occasion. If you don't live near Hougang or Heartland Mall Kovan, it's okay because Pizza Hut is available everywhere in Singapore and there's also a delivery service. Also, do check out my previous Pizza Hut Delivery article here. Order Big Pizzas from pastafresca the Italian Restaurants Singapore Famous for tasty Italian thin-crusted pizzas.